As we saw on our 2018 marketing trends list, the use of voice search is only growing in popularity. More and more users are turning to Siri or Alexa to perform searches to get them the information they need. With the popularity of voice search growing, it is important to recognize this shift, and implement SEO tactics to help optimize your website for voice search so you are not missing out on any opportunities. We recommend not completely changing your website to cater to voice search, but rather make small changes that can help ensure you are more successful when a voice search is conducted. Below are some tactics to implement into your SEO strategy to help optimize for voice search. Local business is a key category people search for when conducting a voice search with their devices. These devices conduct an internal search and find the top businesses in that category. Below are the ways you can improve your ranking with local voice search. Major Online Listing Platforms: It is important to have your business listed on the major online business listings. Google My Business, Apple Maps, Yelp, and Bing Places for Business are the most important online listings, as the most popular devices automatically pull data and results from them. Correct Information: Make sure your contact information across all platforms is the same, and accurate. If you have an old address on one listing, it can hurt your chances of being found. Be as descriptive as possible when describing outlining and choosing categories for your business. Reviews: Get as many reviews as you can. Reviews play a huge part in the ranking of businesses and people are more inclined to visit a local business if there are reviews. Click here for more information on optimizing your online listings. Single keywords are not being searched for when a user is conducting a voice search, instead it is conversational questions and phrases that make up the majority of searches. That does not necessarily mean changing your current keyword implementation to phrases, but you should implement this tactic in small ways. We suggest making an FAQ page, or addressing common questions you receive from your clients on a page of your website. Look at your Google Analytics for key phrases the user is using, and try to implement them in your copy. Structure Data: Implementing structure data can aid in helping search engines find the most appropriate information on your site. Structure data generates the rich snippets that come up in organic search results the majority of the time. This is where Google first gets their information when replying to a voice search. It is a way for search engines to better understand what the information is on your site. Crawl: Look at your Google Search Console and make sure there are no crawl issues on your site. Crawl issues can lead to search engines not understanding what is on the pages of your website. This is not only good practice for voice search SEO, but SEO as a whole, no matter how your website is being found. Mobile-Friendly: Being mobile-friendly should go without saying, but we thought we should mention it. Making your website mobile-friendly is extremely important in the overall success of your website, but especially with voice search. 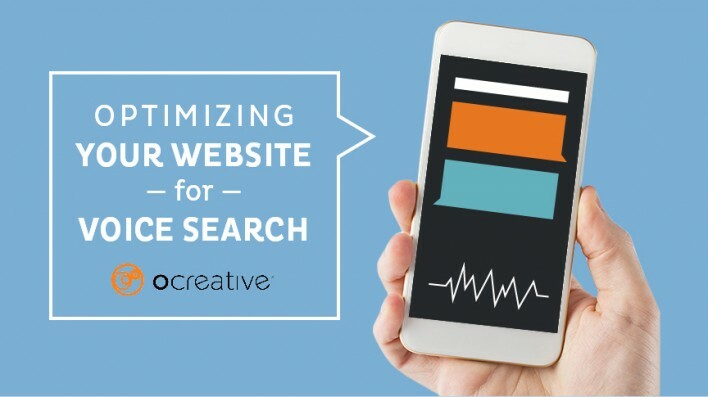 If your website is not optimized for mobile, you most likely will lose that potential customer who found you. As the year progresses we will continue to see a growth in voice search and many more ways to optimize for it. Again, it is important not to completely overhaul your website for voice search as it still relies on traditional SEO tactics you have already implemented. Starting with adjustments to complement voice search will help greatly.